Chrome offers the freedom to deploy modern HTML5 and cloud computing applications without worrying about legacy browsers’ ability to keep up. Speed boosts productivity. That’s why Chrome is built to be fast in every way — starting up from the desktop, loading web pages, and running complex, business-critical web apps like Salesforce, QuickBooks Online, and Concur. Chrome runs fast even on lower-end machines, which can save money by extending the life of your current hardware. Google Chrome for Business uses technologies like Safe Browsing and sandboxing to help protect your organization from malicious websites, viruses, malware and phishing attacks as your employees browse the web. And Chrome’s cross-site scripting protection offers added security against sites that try to steal company and employee data. Chrome for Business makes Google Apps work better — it was designed from the ground up to optimize products like Gmail, Google Docs and Google Calendar. Chrome supports many features that aren’t available from other browsers, including Offline Gmail, Docs and Calendar, as well as desktop notifications and editing features like drag-and-drop and cut-and-paste. Chrome for Business is easy to deploy and manage. Instead of spending time policing browser configurations and Internet access, IT admins can customize and deploy Chrome as business needs dictate. For example, they can enforce usage of extensions and Google Web Store apps via group policy across their organization, and give specific groups access to different apps by default. Yes, you can run a business through Chrome. 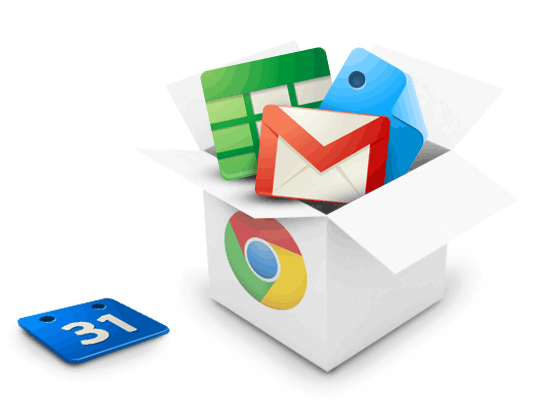 The Chrome Web Store offers hundreds of extensions and applications that you can bundle with Chrome and distribute throughout your organization. Complete HTML5 support without OS upgrades lets employees run powerful, scalable web apps on Windows, OSX and Linux. Deploying Chrome means not having to upgrade your OS or buy expensive client software in order to improve performance and security. And because you don’t have to remove your current browser to deploy Chrome throughout your company, you can run legacy apps in Internet Explorer and let Chrome take care of the rest. Organizations that wish to trade up to Chrome but have employees who need access to legacy apps can also try Google Chrome Frame, an IE plugin that handles web pages in Chrome.